To be able to understand their mechanism of locomotion we have to know a bit more about the amoeba's anatomy. The cytoplasm inside the cell is capable of changing into different states. It can turn very easily from a fluid into a solid state and vice versa. The fluid state of the cytoplasm is called plasmasol, the more solid state is called plasmagel. When the organism locomotes the plasmasol flows through the center of the cell towards the front. When the plasmasol moves to the sides it becomes solid again. This way the cell can propel itself as a whole but can also send pseudopodia in many directions. 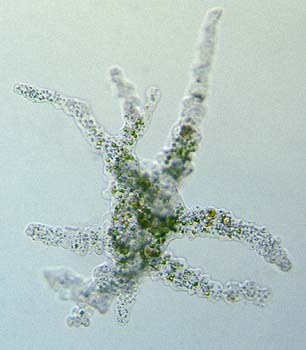 It is this pseudopodia movement that enables the amoeba to capture prey. These two images of Amoeba proteus shows how a fast moving ciliate is surrounded by quick developing pseudopodia. 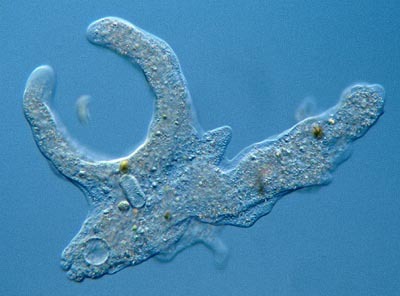 The amazing thing is that the amoeba don't touch the ciliate until it can't escape. Usually the pseudopods form a kind of 'dome' that makes escaping impossible. They have to have some sort of chemical detection since they notice a prey without having to touch it. There is another method of transportation some amoebas are able to perform. 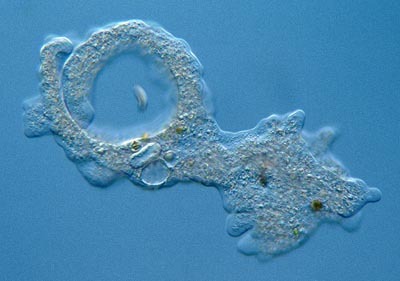 When Amoeba proteus is disturbed (this happens often when you examine it since scooping up will disturb the amoeba) it will change into a shape like a star with long pseudopods extending into all directions. This shape allows it to free float in the water. All comments to the author Comments to the author sent via our contacts page quoting page url plus : ('wegmond','')">Wim van Egmond are welcomed. Published in the September 2001 edition of Micscape Magazine.